We look at the world and think, “Oh, my…,” but it wasn’t that long ago that we were just like them. In fact, not only were we deceived and foolish, disobedient and enslaved, God says we were His enemies. The Good News, for us and them, is that while we were still His enemy, He loved us so much that He paid the price to reconcile us to Him. The New Living translation says we were “restored.” That’s a big deal. Our sin separated us from God. Nothing else can. Jesus became sin, so that we could bridge that gap that our own sin put between us and our Father. Then God, in His love and mercy, went a step further. He made us brand new. That old us has passed away, if we have truly accepted Jesus as our Lord. Now instead of His enemies, we are His children. 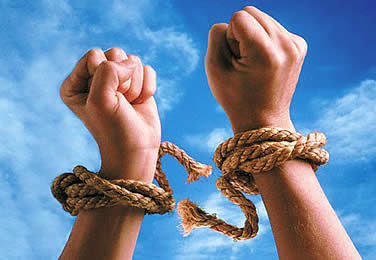 We are no longer slaves to sin, we are free in the family of God. We are heirs and joint heirs with Christ! We can do what He did while on this earth, and according to John 14:12, even greater things. At Christ’s death and resurrection, He ascended to Heaven and left us the Holy Spirit. Now with His help, the Holy Spirit’s, we can do even greater works. We just have to believe. Most of us have no problem believing that Jesus did miracles. Our issue is not belief in His power, or ability, it is unbelief in who we really are. We think we are still His enemy, still a slave to sin, still captive in this world, but we are not. We are no longer an enemy to God. As His dearly loved children, He has given us authority! Miracles should be happening where ever God’s children are! We should be seeing salvations, (the greatest miracle of all), blind seeing, deaf hearing, lame walking, addicted delivered, and lives transformed. I have done so many things scared! It is even comical to think about some of the things. But, I am growing stronger in the things of the Lord. I used to be shy and introverted (unless I was under the influence of a mood altering substance). I hated new schools, moving, meeting new people or anything that took me out of my comfort zone. I hated all forms of confrontation, even the good, healthy kind. Now, I am not shy. I love meeting new people. I can talk to anyone with ease. I may still get a little shaky if I have to get up in front of a lot of people, but even then, after the initial few minutes, the ease comes. I know that I am doing what pleased God, how can we not be confident in that place? Don’t you think the rest of the world should know that they don’t have to stay His enemy? Jesus, thank You for reconciling, and restoring us to our Father. Whenever I feel small, unworthy, or lost, I will remember that I am His child, that He loves me dearly, and that You left me Your Spirit to guide me. This entry was posted in Thoughts and tagged Bible, children of God, Christ, christian, Christianity, faith, friends of God, help, Holy Spirit, hope, Jesus, Lord, love, Salvation.